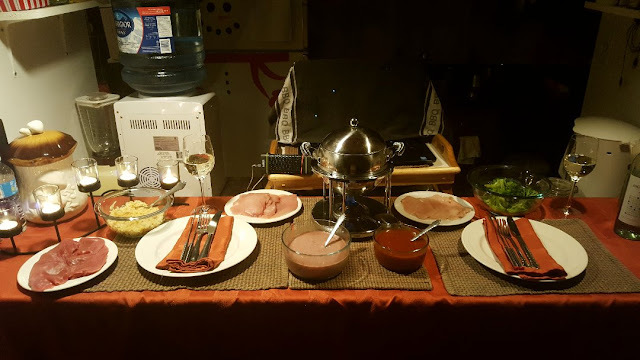 Rain's Garden: Scribble Picnic: Hot Chocolate and Fondue Nights! This week's Scribble Picnic theme is "Hot Chocolate". During the next few months, my goal will be warm and cozy as we enjoy what winter has to offer. Sitting by my window on a cold winter night, looking at the Moon and watching the snow fall with a big cup of hot chocolate (laced with a little rye whisky!) is warm and cozy! I painted this scene with watercolours. Whoda-thunk-it? On the 14th of each month, Alex and I have a fondue night to celebrate our "monthly anniversary". 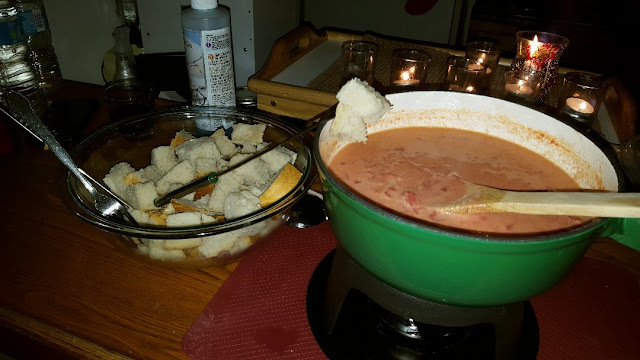 December 14th's fondue night brought a big storm and a power failure. Guess what happened again on January 14th??? Big storm and a power failure! Kind of weird huh? :) There was a big blizzard and wind storm that knocked the lines down. This one lasted nearly 5 hours though, so it wasn't very pleasant in -25C weather. 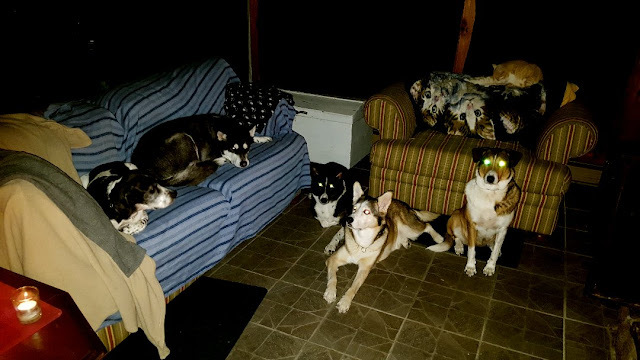 We had all the pets in the living room with the fire going. We were all able to keep warm though thankfully! Monday was Alex's 30th birthday! 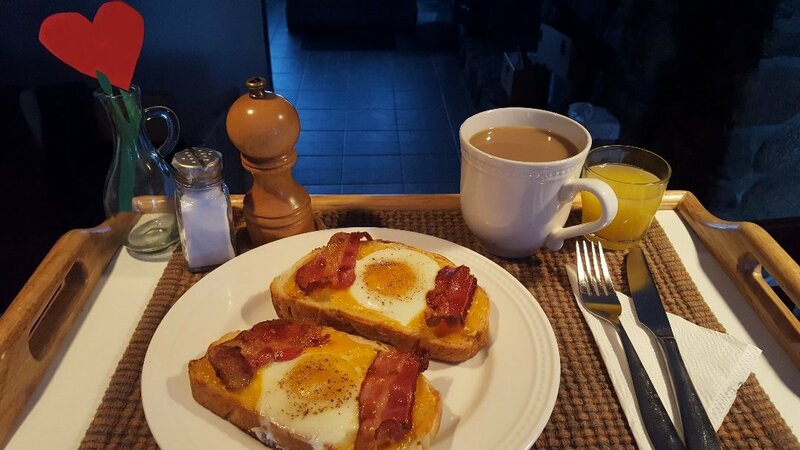 :) I made him breakfast in bed, his Grandma's recipe for "Toast-ettes". Here's an action shot of my cooked chicken. When fondue meats are on sale, I buy a bunch of them for the freezer. It's very difficult to slice meat as thinly as the butcher does; but it can get pricey if you buy the meats regular price. They're also good to make Philly Cheese Steaks. The hounds. I think I will take their lead and laze about for the rest of the day. :) It's too cold to go outside! You don't need power to have a wonderful time of it! maybe it will involve bacon! Happy Birthday, Alex! I thought of you this week when I was grocery shopping, Rain. I saw BAGGED SWISS FONDU for sale! Can you imagine? I just shook my head and put it back. The great recipe I have for Hot Pot à la Chinoise fondu came from a Quebecoise friend about 40 years ago -- just delicious! Oh my, more power outage! And a recurring one, at that! -sigh- And with those temps! I am such a wimp, with what we think of, as awfully cold. Hahhhhh... Compared to your lows, ours are nothing. All that delicious food you make, certainly takes the edge off the cold though! Belated Happy Birthday to Alex!!!! We are in a "Marshmallow Covered World" again. It is very pretty. But I worry about lots of snow, on power lines. But! Worry does nothing!!! your painting is beautiful and is very cosy!!! 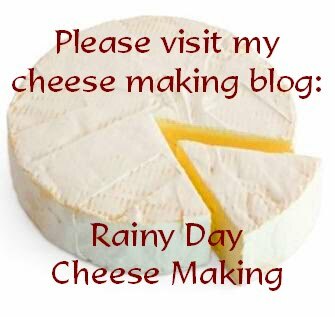 Rain you are honestly a force to be reckoned with, look out Martha stewart lol,,you are an amazing cook!! The food photos are fantastic! And I LOVE the window painting. I love your drawing. Sitting here looking out at the snow we had yesterday. Enough to cover the grass and make the roads a mess. It has been crazy cold here in TN this yr. We don't normally have temps this low. Last yr we only had a dusting of snow. This is our second one in a week. 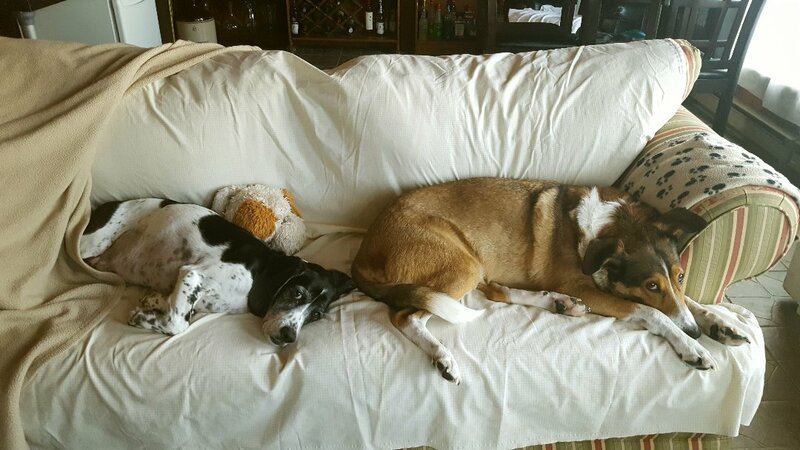 The cold has be lazing around like the pic of your dogs! haha....Dakota stays right next to me while Lily is not a cuddler. Stay warm, stay safe, keep those furbabes warm also! Smiles. Ooh I love the Hot Chocolate scribble picnic! They should be greeting cards! Hot Pot is one of my favourite things ever! I haven't had it in years though. Hope the Feb 14th fondue/anniversary/v-day goes well!! Say happy birthday. The mid-month fondue night is a good idea. You and Alex make the best of everything. What a wonderful relationship you two have. Lovely sketch for the theme, Rain! I know computer monitors can vary in colour tones but, on mine, it's a lovely Teal blue/green...one of my favourite colours. I love seeing all the pics of the pooches! I like your 'rigged' fondue pot....I may do that since I don't have a pot although I think I could pick one up really cheap as I see them at the thrift stores. Happy Birthday to Alex! 30? I am more than twice his age! LOL! How sweet of you to fix him him all his favorites. 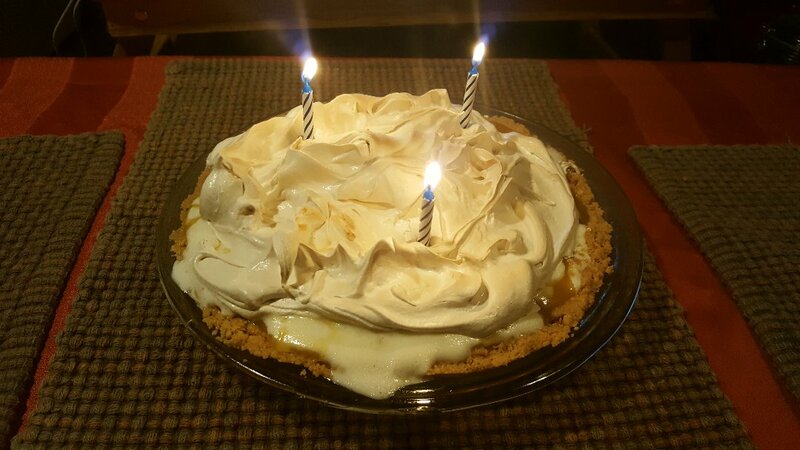 My favorite is lemon merengue pie but that one sounds too sweet for me but it sounded really good with lemon curd and ice cream too! Your 'pack' is so darn cute and they all have such unique expressions. Rain, it's always fun to come to your house and see a slice of your life. It's a good life, darling animals, warm and friendly food....you are most inviting. 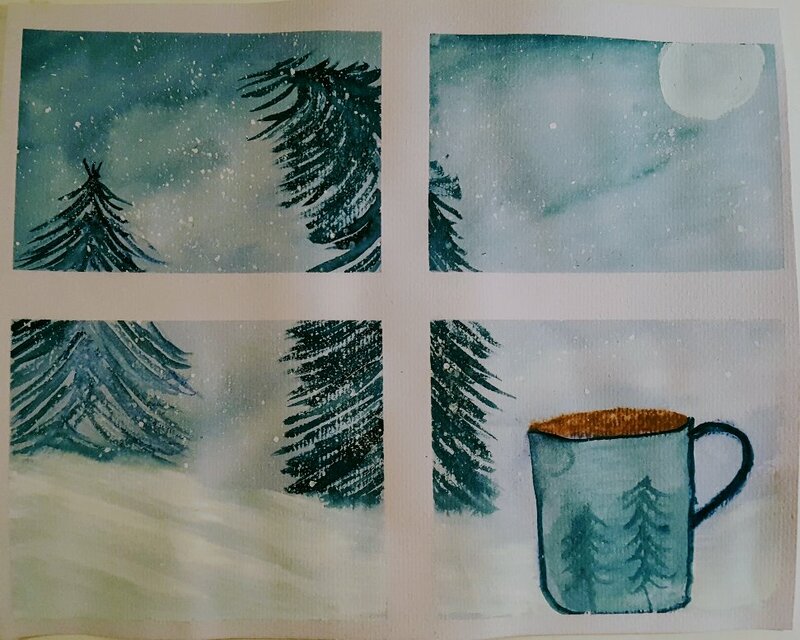 Your painting of the winter scene and mug to match is so cozy and love the rich and beautiful greens and blues. You food is to die for....or should I say to live for!!! haha. Blessing,...have a great day. The food always looks so good at your house! Happy Birthday to Alex, that's a big one. 5 hours is a long time to go without power, we have a gas fireplace which is reassuring. You set the scene so beautifully for your hot chocolate, I love the idea of sipping in by the window under the moon. I love the green and teals you used in your Scribble. What a loving and thoughtful wife you are. What a lucky husband he is. I'm sorry you had another power outage again. I'm glad you were able to at least keep warm. I have to try hot pot at home. My kids have never had it. Thank you for your recent visit. I love green, blues, and purples for sure. And thank you for telling me what are your favorite pens to use. I'll look them up. So glad you are joining in with Michael and I in our sketching! I used to love fondue, we did all sorts growing up but my husband doesn’t Care for it so I haven’t had it in years. Used to be a New Years treat especially! Your painting is gorgeous! I love it. Such a comfy and cozy winter scene. It is a beautiful season and I can't imagine living somewhere where we didn't enjoy four seasons. I only wish it didn't get as cold as it does sometimes. And that it didn't last so long! I love fondues but we haven't done it in ages. I used to enjoy doing them together with the girls when they were young. Our favourite was chocolate fondues but we also enjoyed fondues with thin slices of meat. That was so tasty! We have a brand new fondue set and I keep saying I'll take it out, dust it off and put it to use. One of these days! I was a huge fan of the disco era. My friends and I used to go downtown and get into dance clubs with our fake ID's. Did you have one of those? They looked soooo fake...lol... Anyhow, we went there to listen to the music and dance. I still play disco songs sometimes and dance around the house. Unfortunately, I never went to Caesar's Palace in Lasalle, although I'd heard of it. It's not an area we knew at all and we really didn't hang out there. And most important of all, happy birthday to Alex! Wishing him many more happy and healthy years ahead! I love your painting Rain. It is the perfect wintry scene. So sorry about the power deal. We've been without power in the winter and I know it's not fun. Glad it didn't last that long and you were able to have your little celebration. And that pie is making my mouth water!!! Your painting here is wonderful, Rain. I love it. Did you use masking tape there too for the windows? look great! It's perfect for the theme and oh so cozy...just like your life and those fab rituals you and Alex share. Happy belated bday to him too. That lemon meringue looks utterly gooey and delicious. Way better than my doughnut. Yum! ha. I love hot chocolate with peppermint extract in it. That's my fave :) So cozy to drink. That pie looks good! (sans meringue for me). Was it hard to make the curd? LOL - our house has baby gates up too! 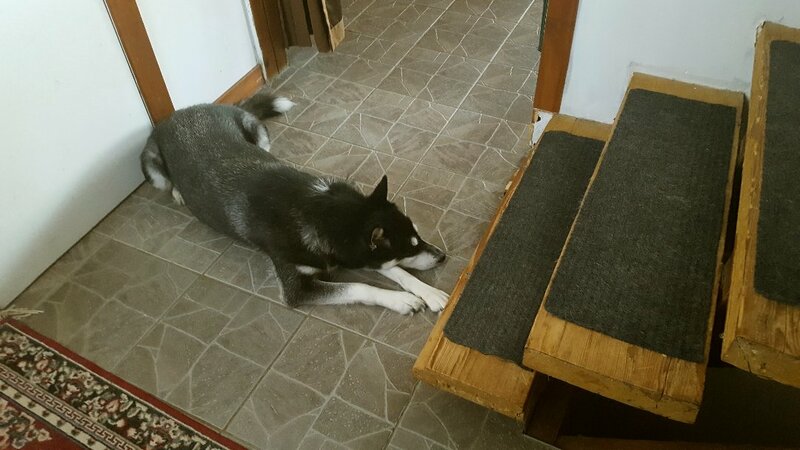 One day I am sure that once all the puppies get out of puppy hood than maybe the gates will come down. But for now they stay up! I love your painting - it really captures the feeling that hot chocolate gives one. Isn't that interesting, storms on your monthly anniversary...hmmmm. It looks so cozy with the dogs. And that pie - OMG. That pie. I almost was brought to tears. Happy Birthday, Alex! I love your watercolor! 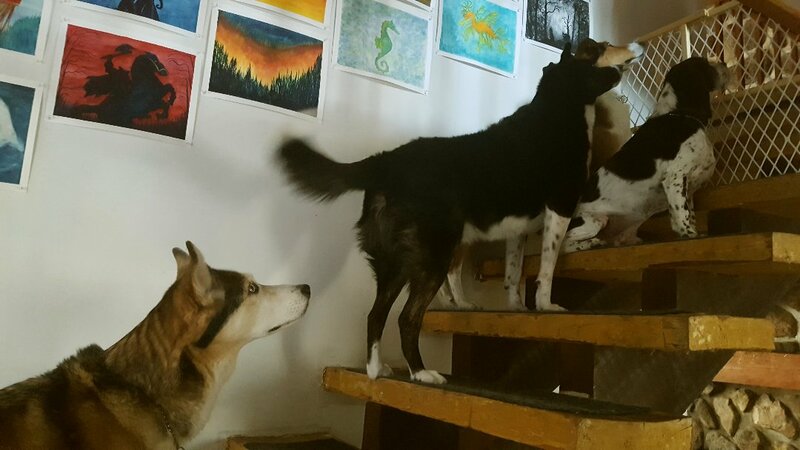 And that shot of the dogs on the stairs is great. Happy Birthday to Alex! 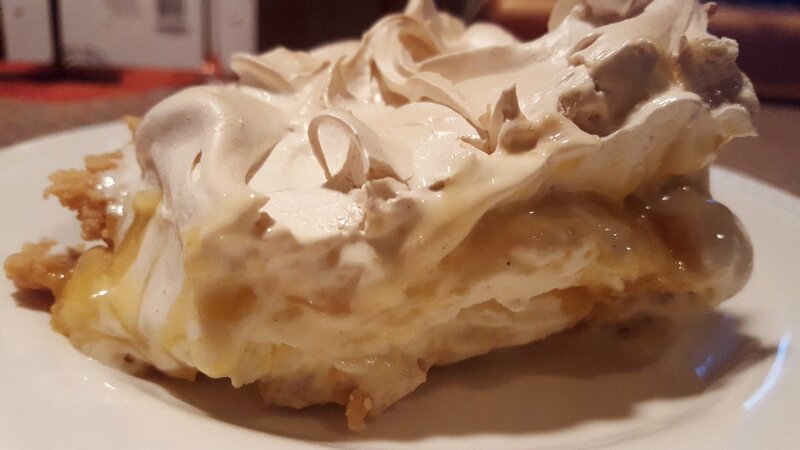 And oh my, the pie. Lemon is my favorite and who doesn't love ice cream. I'll have to try this recipe. Rain I love your piece for the Hot Chocolate theme - wasn't it a fun one this week! Those doggies are amazing to me - one is a lot of work but five must really keep you hopping. The looks in their eyes are so loving though - and it's nice they get along with the kitties too! You amaze me Rain, and your cooking skills are awesome too! Belated Happy Birthday to Alex. Happy weekend - stay warm. Thanks John :) I love this monthly tradition! Hi Sam :)) You could probably easily find a fondue pot at a thrift store! The stores here have lots of them, but we wanted to find a nice new one because we will be having lots of fondues in our lifetime!! That Raclette machine that melts the cheese, that was a $6 or $8 (can't remember) thrift store find too. 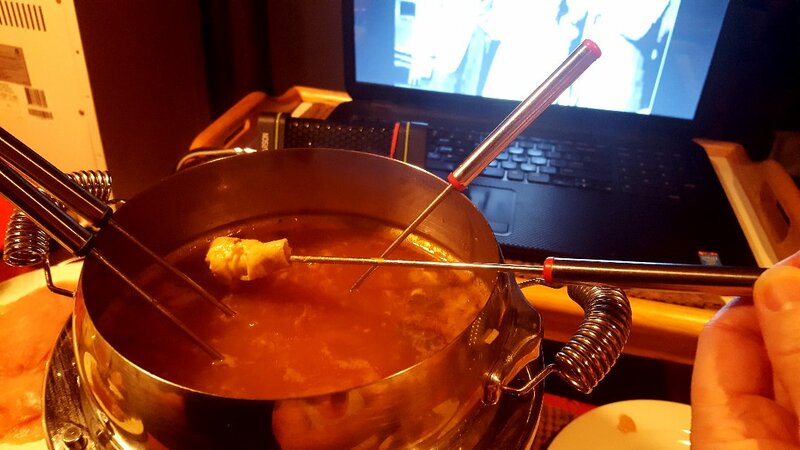 Next time we go out, I'm going to try to find a small fondue pot for chocolate fondue. Yeah, Alex is just 30 :) The pie was SO sweet...mostly from the meringue though. Thank you Wanda :) Ha ha ha...I hope my food is to live for lol! Though I have to start being a bit mindful of fats! Thanks Christine :) I have a nice window here in my office (the former dining room) and when the moon is out, it's gorgeous. I often sit and just enjoy the view. It's all so blue outside in the winter! Oh that's great to have a gas fireplace. I can handle no power and water (we have candles, flashlights and a big supply of extra water)....but heat in the winter? That scares me when we lose it. Hi Martha :) Charlie will NOT expend any unneeded energy. I call that LAZY lol...actually Marlene is the same, she'll be lying down and if S&P start playing, she'll just bark from her laid down position, no need to get up lol...And thanks! That painting was fun to do. But I agree about the cold...it gets right into my bones it seems. Thank you Lorraine :) The pie was so good! I still have some lemon curd so I'm going to make yet another one tonight lol...musn't waste! :) This was a long outage. Normally the power company gets it back going quicker, 5 hours was a little long in such cold weather though. Thank you Michael :) Yes! I used masking tape! I use that for the borders all the time, it works really well with the watercolours! I just thought of it last minute when I thought of a window. My own windows don't have those frames, but I thought it looked nice! Ha ha..I must say that yes, the pie was much better than ANY doughnut lol! :) Though yours looked delish! Thanks Susan :) Yeah, interesting...I hope it's not some kind of omen about those storms! I'm just thinking it was a terrible fluke, but if it happens on Feb 14th, I'll be a little suspicious lol! Ha ha..brought to tears...I think it's gluten free though with graham crackers? Do they have gluten? Thanks Leigh :) The combination of the ice cream and lemon curd...oof. It makes it so nice and creamy! I hope you do try it, let me know if you do! Hi Mary :) Thank you, it was a fun one this week! :) I already have my idea for Table Cloth! :) Five dogs is a lot of work...but as the days go by, it is getting easier. There is always an adjustment period when you add a new pet and in our experience it's from 3-6 months before things calm down. And it's not just the new pets, the other ones act up too, all trying to get used to the new pecking order lol...We just have one of the three cats that is still kind of nasty to the dogs and tries to swipe them, but he's learning that it's not such a good idea when the dogs bark back at him! Your painting looks like it felt here yesterday, with the wind driving the snow along. Now why in the world didn't I think to fix a cup of hot chocolate? I have not figured out how to post on Instagram. Micheal tried to help me, I even watched a youtube tutorieal, but my computer doesn't seem to have the same prompts that they had so that didn't do me anygood. And, I now seem to have two Instagram accounts. One I knew I had and then another suddenly appeared after Micheal tried to help. 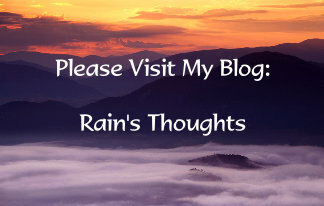 I just threw up my hands in disgust and made a new page on my blog and I am posting there. If you click on the little mouse at the sidebar it will take you to the few drawings I have accomplished. I am open to suggestion, Rain if you know something I haven't tried, otherwise I thank you for your thoughtful offer and it will just have to be what it is :) You are a sweetheart ... Thank you, Rain.